Are you looking for a new soup? 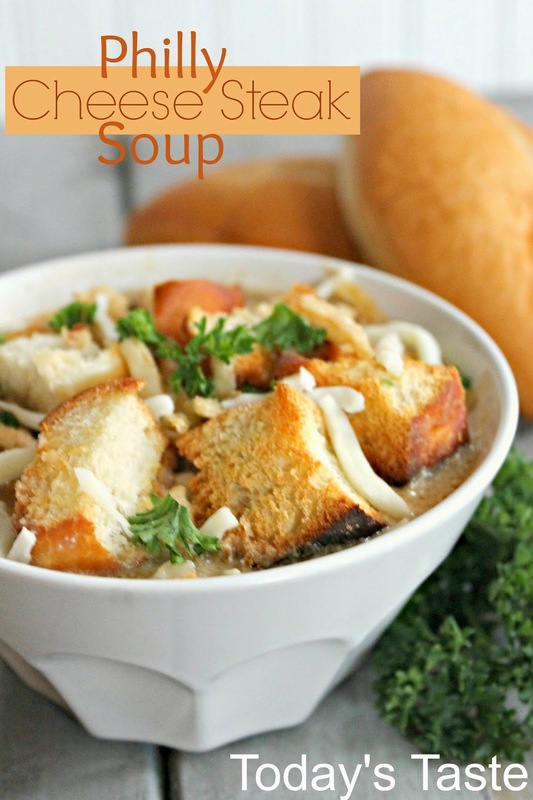 This Philly Cheese Steak Soup is to DIE for! With the homemade bread croutons and french fried onions on top, it really doesn't get much better! Add onions, garlic, steak, Worcestershire sauce, and mushrooms to a slow cooker. Whisk together the beef broth and flour and add it to your slow cooker. Cover and cook on low for 6-8 hours. One hour before serving, turn slow cooker to high heat. Add the American cheese and cream cheese. Stir every 10-15 minutes as the cheese melts. Preheat oven to 400 degrees. Toss cubed bread with 2 Tablespoons of olive oil. Season with salt and pepper to taste. Toast for 5 to 6 minutes, or until bread is golden and crispy. Ladle soup into bowls. If desired, top with shredded mozzarella cheese, toasted bread cubes, parsley and French fried onions.